Has anyone ever asked you what your super power is? It’s a strange question, but it does make you think, “do I have a special super power?” You might not be able to fly, jump tall buildings, or run very fast. We might not have those kinds of super powers, but we do have something very similar. We each have abilities, insights, passions, and capacities that are unique to us. We can do things that many others cannot and when we use our abilities for the benefit of others in the unique places where we live, that’s really the very definition of a super power. How do we know if we have a neighbourhood super power? We can discover our special abilities often by just asking others what they see in us. We cannot clearly see our own skills and passions, but friends, family, and colleagues often see and celebrate our special abilities better than we do. I have neighbours who have amazing gifts to share. Some are easier to spot – a woodworker, amazing baker, mechanic, and business guru. While some special neighbourhood skills are not so evident at first, they are so valuable. 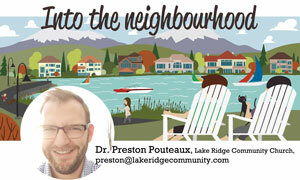 The best neighbourhoods have people who actively listen, watch out for kids, connect with newcomers, bring peace into painful or challenging situations, or encourage new projects. Whatever the super power, the important common thread between all of them is that they are shared. In every neighbourhood there exists a unique blend of skills and abilities that can make that place truly special. Growing up, I discovered that one of my neighbours had a basement full of remote controlled vehicles. I was amazed! As our friendship grew, he invited us over to see his collection. He just thought it was a private hobby, but to us his hobby was an adventure. One winter morning I looked out of my window as a young boy and saw our neighbour clearing snow off of our driveway, not with a shovel, but with a monster-truck remote controlled vehicle fitted with a mini show blade on the front. From his front porch he was sharing his hobby, his special skill and passion, with me across the street. I loved it and made me think about how I might one day share my own quirky hobbies with others. We choose to hold back our super powers because we might not think they are valuable or needed, so we keep it to ourselves. We don’t think that others would be interested in what we have to share. Often what’s holding us back is our own imagination. In truth, our unique passions are often readily embraced by neighbours who want to know us. In my own neighbourhood we love the the family who creates a haunted house every Halloween, we love the neighbours who roast coffee, and the community group that puts on the soap box derby makes our neighbourhood amazing. They share their super powers and we all jump on board. When we share our super powers we bring meaning to our neighbourhood. Something else happens, too. In bringing meaning to our community, we experience meaning ourselves. We discover that we belong. Your neighbourhood needs and wants your special and unique skills and passions, whatever they might be. So be yourself, super powers and all.